What's For Brunch? Featuring Wax Cabin Candle Co. — THE FAUX FANCY. What's For Brunch? Featuring Wax Cabin Candle Co. I used to hate candles. Okay, before you throw stones, let me say that I just didn't really care for them and I didn't appreciate their magic. I have since grown up into a functioning adult and I am proud to say that I am a normal candle obsessive human being. I have candles of every variety of scent and my favorite tend to be on the cotton-y side. Anything with sea salt is also my jam. But imagine my delight when I received Wax Cabin Candle Co.'s brunch candle in my mailbox. Yes, BRUNCH. My favorite basic girl past time IN A CANDLE. I was very curious to see how one could summarize my favorite meal into a scent, but they nailed it. The best part is I would have never thought of mixing these scents myself, but it is so spot on. The brunch candle has notes of rose, chardonnay, blood orange and grapefruit. I'm itching to get my hands on their new Gin & Tonic scent to complete my boozy collection because we all know how this girl loves her booze. 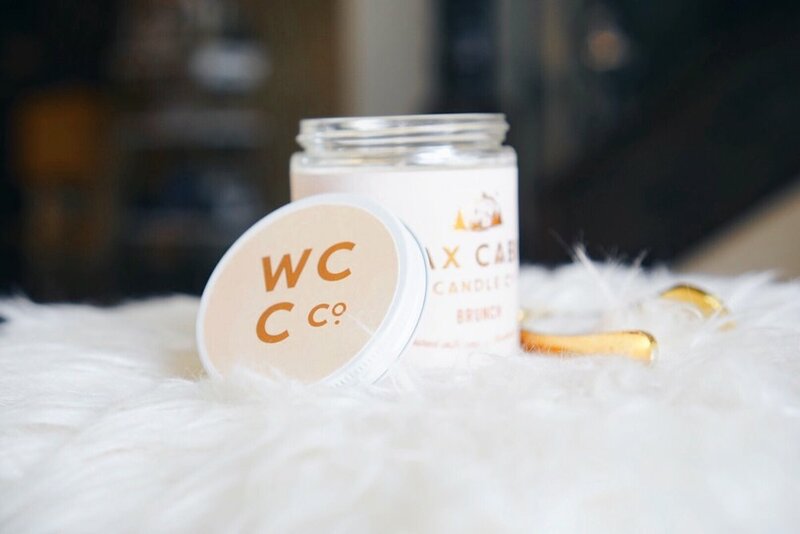 Wax Cabin Candle Co candles are soy based and made with love in Jennifer Gunn's cabin in Mendham, New Jersey. Scents range from Cozy Cabin to Cabin Fever, Brunch and Gin & Tonic and more. You can buy them individually or in sets. And, good news for you, Wax Cabin has generously offered The Faux Fancy readers 10% off of the candle(s) of their choice by using code 'FAUXFANCY'. I hope you love them as much as I do! Get you some brunch... in a jar. Disclosure: This post was produced in conjunction with Wax Cabin Candle Co. As always, thoughts are my own. Thanks for supporting sponsors that keep content fresh on thefauxfancy.com.